The medical marijuana issue came to the Michigan statehouse for the first time ever this week. In Lansing on Tuesday, the state House Government Operations Committee held a hearing where medical marijuana patients, advocates, and supporters were given the floor -- and they came from across the state and the country to do just that. The hearing was tied to 5740, a bill that would allow people with 'debilitating medical conditions' to use marijuana without fear of arrest, which was introduced by Rep. LaMar Lemmons III and now has eight cosponsors. But with the legislative session just two weeks away from ending, the hearing will lead to no action this year. It does, however, lay the groundwork for further work in the legislature next year, and perhaps for an initiative in 2008 should the solons prove recalcitrant. That it occurred at all is a testament to the efforts of local activists working in concert with reformers around the country. "LaMar is my state representative," said Tim Beck, executive director of Michigan NORML. "I raised money for him, and he believes in this issue, so when he asked what I would like, I said I would like a medical marijuana bill," Beck told Drug War Chronicle. Beck was a moving force behind the successful 2004 Detroit medical marijuana initiative. Ferndale, Ann Arbor and Traverse City have also enacted ordinances permitting use of marijuana for medical purposes. Lemmons, a Democrat, introduced the bill, but to get a hearing also required the assent of the committee chair, Republican Rep. Leon Drolet. Not only did Drolet agree to hearings, he became a sponsor of the bill. 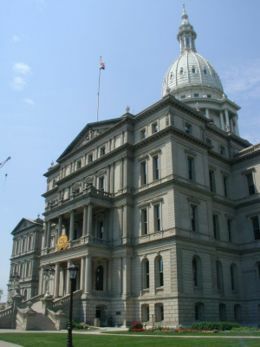 With that opportunity, the Michigan activists reached out, and, working with the Marijuana Policy Project, brought in people like federal medical marijuana patient Irv Rosenfeld, Republican Connecticut state Senator Penny Bacchiochi, and former Maryland legislator Donald Murphy, head of Republicans for Compassionate Access, as well as patients and supporters from across the state. Up against them was peripatetic deputy drug czar Scott Burns, who magically shows up to argue against medical marijuana wherever it appears. Rosenfeld, a Florida stockbrocker who suffers from multiple congenital exostosis, has been receiving US government marijuana since 1982 in a program that was extinguished under President Bush the Elder. Rosenfeld and a handful of others were grandfathered in. "I'm a very productive member of society because I have the right medication," Rosenfeld told the committee, adding that the 10 or so joints he smokes a day help keep him alive. "There is no need for prosecuting people who are sick." Rep. Bacchiochi, the Connecticut Republican, has been a major legislative supporter of medical marijuana in her home state, and was eager to talk to her fellow solons about it. She told the committee how her husband was diagnosed with terminal bone cancer in the early 1980s and a doctor urged her to try marijuana for him. "I hadn't smoked marijuana, I had never done drugs, I knew I wanted a public career. It was a terrifying moment for me," she told the committee. "But as I watched my husband basically die in front of me, I decided I would do it at any cost. For three years I went out and I bought pot for him, and I watched his remarkable recovery. Not that he recovered from the cancer, but he was able to eat, he was able to laugh, he was able to regain some quality of life," she told lawmakers. Laura Barber of Traverse City spoke of the difficulties her family went through when her husband, who uses medical marijuana to treat the symptoms of multiple sclerosis, was arrested. Two other Michigan patients were ready to speak, but time ran out before they could testify. They were Rochelle Lampkin of Detroit, who uses the drug to treat the pain associated with multiple sclerosis, and Martin Chilcutt of Kalamazoo, a Navy veteran who used medical marijuana to relieve the pain and nausea associated with cancer chemotherapy. "The medical use of marijuana has helped to relieve the pain and suffering associated with serious illnesses in my life and in the lives of several close friends of mine," Chilcutt commented. "We need rational decisions and action to combat an irrational status quo. The most perilous aspect of using medical marijuana is the threat of getting arrested and going to jail, and that's why the legislature needs to pass HB 5470." The bill is likely going nowhere this year, but this week's hearing was important, said Beck. "The value of having the hearing is that it demonstrates we have power. We were able to get the hearing, and we were able to bring in heavyweights like Irv and Don and Penny. I don't think those legislators expected anything like the performance we had," he laughed. "This is an historic first, and we got massive publicity out of this hearing," Beck continued. "We're laying the groundwork for next year. The one thing we have is the initiative process, and I think the legislators understand that. The Democrats will control the state House next year, and I think we'll get a better reception then. But it will be like 'Do you want to write the law or do you want us to write the law?' We don't want to do an initiative if we don't have to. It's cheaper to go through the legislature." I am in the nursing field of geriatrics and have watched a resident (alhzeimers)go from literally starving to death because he would'nt eat to stealing food from other residents,had it not been for the physician stepping up and perscribing medical marijuana this resident would have starved himself to death.It is in my opinion that the nursing homes should be the first place that gets the approval,NO ONE should have to die this way!